Gathering recently were, from left, James F. Gaertner, SHSU president, and staff excellence winners Cindy Allbright, Charlann Morris and Christie Davidson. 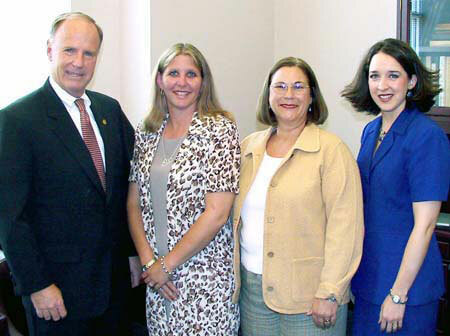 "Going above and beyond the call of duty" is the recurring statement used in describing the work habits of the three Sam Houston State University employees who have been named to receive the 2003 Staff Excellence Award. Christie Davidson of the Correctional Management Institute of Texas, Cindy Allbright of the Department of Recreational Sports, and Charlann Morris of the Department of History were named this week by SHSU President James Gaertner to receive this year's highest staff employee award. Three awards are given annually to full-time staff members who excel in their job duties through excellence in service, proven commitment, meritorious performance and a high level of motivation. Staff members are selected based on nominations by their peers, supervisors and members of the SHSU faculty. In addition to a plaque of recognition, each recipient will be honored during a general university meeting at the beginning of the fall semester and awarded a $1200 bonus. Davidson is a project coordinator for the Correctional Management Institute of Texas. She began her career at Sam Houston State as a student assistant in the University Advancement Division and was later employed as a student assistant in the College of Criminal Justice. When she graduated with the bachelor of business administration degree, she was hired as a staff assistant for the Correctional Management Institute. She was later promoted to administrative assistant. Davidson enrolled in graduate school at SHSU and completed requirements for a master of business administration degree in 1999. That same year, she was promoted to program coordinator. In addition to managing a number of training initiatives and several professional organizations, she serves as chief of staff for CMIT. She also helps coordinate activities associated with a national professional development program for newly appointed probation executives. "Ms. Davidson is called upon to interact with criminal justice practitioners and governmental officials from throughout the United States and several foreign countries," said Dan Richard Beto, executive director of the Correctional Management Institute of Texas. "She represents the university and Criminal Justice Center exceptionally well. "She has an excellent attitude and her motivation is evidenced by the manner in which she brings timely and successful closure to tasks," continued Beto. "The fact that she enrolled in graduate school and earned an MBA while employed full time is also an indication of her motivation for self improvement. She is a self-starter who requires little guidance." "Christie's work has been especially recognized by the National Association of Probation Executives and National Institute of Corrections for contributing in a great variety of ways," said Ronald Corbett Jr., past president of the probation executives organization. "She is unfailingly courteous and helpful in working with all to make the myriad of details connected with such a program come together," said Corbett. "She makes herself available and responds to any requests for assistance or any emergencies that may arise. Christie has put a human and very helpful face on SHSU and has served as a great representative of the university," Corbett said. "The U.S. Department of Justice-National Institute of Corrections holds training events nationwide, and I am pleased that we have for several years held such training events at Sam Houston State University," said J. Richard Faulkner Jr. of the Community Corrections Division. "Christie has always been part of the support staff for these training events and while those duties may be part of her position…she has always gone that extra mile," he said. "She has assisted on Saturdays and Sundays with transportation for participants. She has aided with transportation needs after-hours taking participants to dinner off campus. She is always eager to help and no task is too large for her to handle," Faulkner added. "She is such a great representative for the university and the Criminal Justice Center," said Mark S. Williams of the Texas Probation Association. "She is extremely organized, very concerned with important details, and always willing to go the extra mile," said Williams. "I firmly believe that if anyone is recognized for outstanding performance, it should be Christie." Allbright is a secretary III for the Department of Recreational Sports and has been employed at the university since 1992. Her co-workers commend her over and over for her outgoing, energetic, thoughtful and upbeat attitude, as well as her efficiency and her high level of productivity. She is also recognized for her ability to touch the lives of the students who come into contact with her. Keith Jenkins, director of recreational sports, reports that since her initial employment, every graduating class has had at least one student who has formally written that Allbright has had a positive influence on them becoming who they are. "What better example for those who work in higher education," he said. She is also noted for her contributions outside the office. 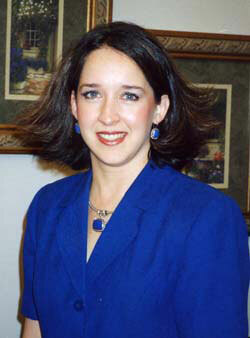 "In addition to her outstanding job performance, Cindy has been involved in University Women, university-wide American Heart Association activities, served on many university committees, been an active member of the SHSU Buyers Group for the Walker County Fair Association, and has gone out of her way to support programs such as the presidential inauguration and special events such as the Sam Houston Bicentennial Celebration," said Jenkins. "Cindy always has a positive attitude, and she spreads that positive attitude to the rest of the office. She is also always willing to volunteer for extra events," said Scott Emigh, assistant director of intramural sports. "Cindy is extremely proactive and assists in helping us overcome problems," said Amy Swingle, assistant director of recreational sports. "She does her job well above 'the call of duty'. The standard phrase in our department is 'If you need something done right and fast, give it to Cindy'." "Her contribution to students goes beyond friendship and support," said Marvin Seale, associate director of recreational sports. "She aids them in developing workplace skills." "Her positive and caring attitude is reflected in the statements of students and how she has impacted their lives," said Thelma J. Douglass, vice president for student services. "It is a joy to know that we have such a positive role model working within our university and impacting the lives of our students." 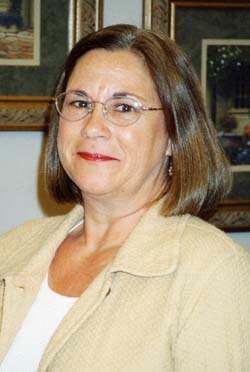 "Cindy helps with all aspects of my program---ordering, budgeting, editing, proofing---all the big and little details. She's on top of all of them!" said Tina Hernandez, assistant director of wellness programs. "She is awesome to work with and be around. I can't say enough about how easy she's made my transition to this campus." Morris is a secretary II for the Department of History. She began her SHSU career in the undergraduate admissions office in 1989, and transferred to the history department in 1992. In addition to working full time, she also earned a bachelor of arts degree in English at Sam Houston State in 2001. Students, faculty and other university co-workers use the words "valuable," "dependable," "compassionate," "positive," "generous," "caring," and "unfailingly helpful" to describe her. "We have found her to be our rock and our support without whom we truly cannot operate," said Caroline Crimm, associate professor of history. "In addition to handling the vast majority of advising for our history majors and minors, she resolves problems regardless of what has gone wrong, she handles the funds and knows where every dollar goes, she orders supplies before we even know they are missing, she types and runs tests and handouts for us, and she runs the office so smoothly we only realize what a disaster it can be when she is gone," said Crimm. "She is smart, quick, accurate, uncomplaining, pleasant, efficient, hard-working and loyal," said Robert Shadle, associate professor of history. "Also, she is friendly and a totally GOOD person." "She has the patience and the presence of mind to manage many of the administrative needs of the department. 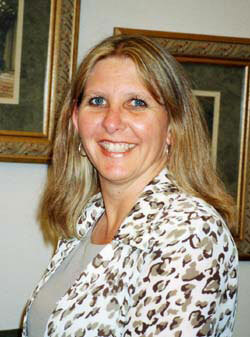 She also has a very positive outlook on life and work," said Nicholas Pappas, associate professor of history. "She is very poised and works very well with faculty, which can at times be like herding cats." "Charlann advises all history majors and minors, is patient with all questions and problems, and never lets the students down," said Susannah Bruce, assistant professor of history. "That may sound basic, but it's actually quite incredible and just a part of why she is so deserving of this award." "I've never been around anyone who has been so capable of handling so many duties and doing them all well," said Ty Cashion, associate professor of history. "Because of her intelligence, and almost prescient ability to prioritize the department's functions, she inspires confidence." "She can make any degree plan clear—even ones outside of this department," said Jessica Kunkel, graduate assistant in history. "Graduation doesn't seem so far away when you've got Charlann to point you in the right direction!" "She has a godly demeanor that shows each and every day," said Bernadette Pruitt, assistant professor of history. "Her personality never changes; she is consistently righteous to all." "She is unfailingly helpful and kind to students, even when they are rude and frustrated," said James Olson, distinguished professor of history and chair of the department. "She understands and is committed to the idea that we exist because of students and that they therefore deserve our best." "She has earned the full respect and admiration of our faculty, a group of brilliant men and women whose personalities, quirks and eccentricities require patience and understanding on the part of a secretary," Olson continued. "In my opinion, she is the best employee, bar none, in the institution, and her work reflects all that is great about Sam Houston State University."